Ginger essential oil has a hot and bright, sweet, spicy aroma that is warming to the body. The oil is steam distilled from the sun dried rhizomes (roots) of the ginger plant. Ginger is known for its strong benefits for the digestive and circulatory system. Also, being an anti-inflammatory agent, it is is often used to relieve muscle pain and its stimulant properties help fatigue and exhaustion. It blends exceptionally well with any of the citrus oils like lemon, bergamot, or grapefruit, as well as coriander, clove, eucalyptus, geranium, vetiver, sandalwood, cedarwood, ylang-ylang, and frankincense. It is a wonderful oil to use in massages to relax sore, tight muscles. A massage oil for sprains combines ginger with other spice oils and the addition of black pepper oil to activate the formula. If you are a ginger fan as I am, or if you at least enjoy its benefits, this recipe for an all purpose ginger root infused oil is a must to have on hand. It can be used for cooking, in teas, or you may add some essential oils if you use it for external use. If you are taking blood thinners, have a bleeding disorder, or have gallbladder disease don't take medicinal doses of ginger. 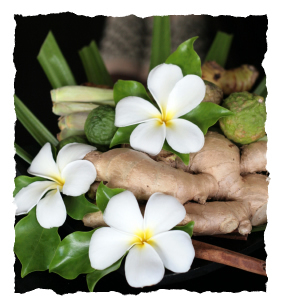 Botanical Information - Rituals & History : Ginger is a tropical plant that thrives in Hawaii. Zingiber officinale, ginger has been cultivated for so long that its exact origin is unclear. Used for a millenia in both China and India, it reached the West at least two thousand years ago. Ginger Constituents: Volatile oil (mainly zingiberone and bisabolene), oleoresin (containing the pungent principles gingerols, shogaols and zingerone), fats, protein, starch, vitamins A and B, minerals, amino acids.